The villa is on the ground floor. On entering the property you will find a sitting room with three comfortable sofas, Sat TV with Sky. Fully equipped kitchen complete with fridge, freezer, oven, microwave, dishwasher, coffee-maker and toaster. Three steps lead you to the four bedrooms. The first one is furnished with double bed. Three more steps and you will reach the first bathroom with Jacuzzi, washing machine, electric iron and ironing board.On the wide corridor there is a nice desk with 24 hour Internet connection wi-fi, a bathroom with Jacuzzi shower.At the end of the corridor there is the a small suite with double bed, a twin bedroom with ensuite bathroom with Jacuzzi shower. From the corridor three steps lead you to the third bedroom with two single beds, the fourth bedroom with double bed. The place where this beautiful property is located is called “MATER” and you can reach it by a public road closed by a barrier and of exclusive use of clients, the barrier is open for public use only twice a week. In the past this land was owned by a cloister that was located in the small hamlet of “GIUSSANA” and the hills were covered by olive trees and vineyards. To honour that beauty and not to spoil the magic atmosphere of the area we have built the property at the foothill. The Villa has a wonderful geographical position and dominates the village of Lierna without overwhelming it and being invisible from the outside but with unique views, it is isolated but central. In front of the house there is the heated swimming pool (approx. 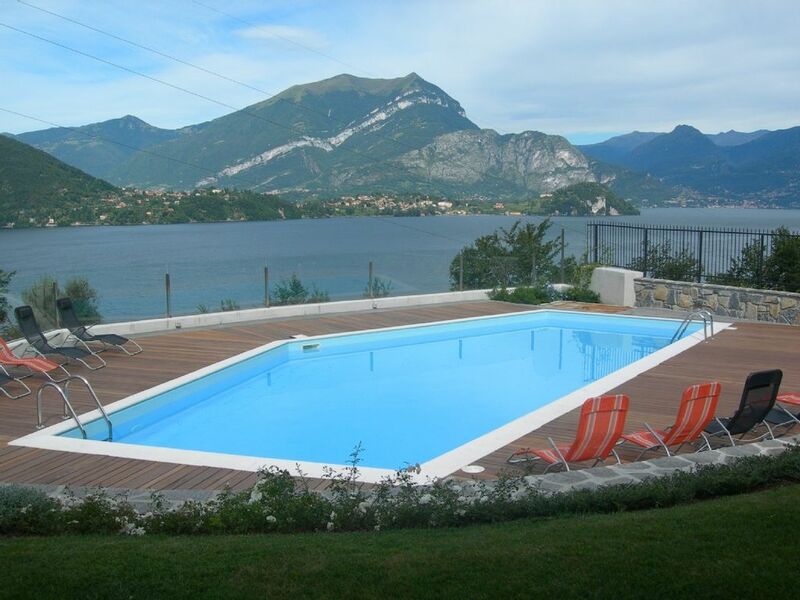 13mt x 6mt) that is located on a wide terrace surrounded by trees and with a breathtaking view of the Lecco branch of the Lake and the promontory of Bellagio. The garden is wonderful and very well cared for. The Villa has also a Patio where guests can eat ‘al fresco’. Private parking places are available. The villa was built using the typical, now rare, black marble from Varenna, the same used for much of the Vatican City, by expert craftsmen according to the ancient tradition. Air conditioning and heating systems are available for clients during their stay. The villa is on the ground floor, on the first floor, the owner with his wife and his 23 year old daughter with whom clients will share the swimming pool. Lierna is a small and typical village on Lake Como. Just 700 metres from the property you will find La Riva Bianca (the White Shore), one of the largest stone beaches on the Lake and just a stone’s throw from the house there is a wide selection of bars, shops and restaurants. For your trips in the Lake area you can easily reach Varenna (5 km), the whole Lake area and Milan catching the train and avoiding traffic. By public means of transport, ferry, passenger boat and hydrofoil. You can also easily reach Bellagio and many other towns & villages on the Lake. The area is also very good for winter sports: St Moritz is just a leisurely one hours car ride away.